A census was taken for the whole of Ireland every year from 1821 through to 1911. Only those for 1901 and 1911 have survived intact. The original census returns for 1861 and 1871 were destroyed shortly after the censuses were taken. Those for 1881 and 1891 were pulped during the First World War, probably because of the paper shortage. The returns for 1821, 1831, 1841 and 1851 were, apart from a few survivals, notably for a few counties for 1821 and 1831, destroyed in 1922 in the fire at the Public Record Office at the beginning of the Irish Civil War. The destruction of the 1821-1851 census returns was a serious blow for the family and local historian. 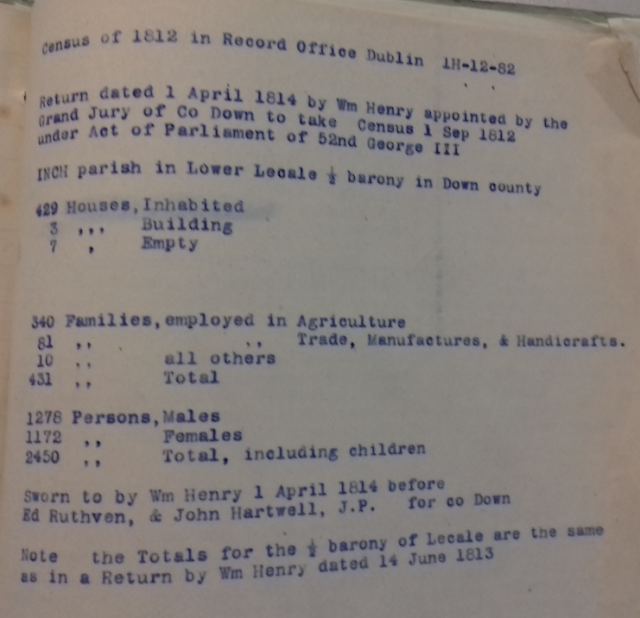 In the absence of formal census returns for the nineteenth century other sources can be traced that provide substitute for the data destroyed in 1922. Church records not only contain information on baptisms, marriages and burials but other complimentary records such as visitation lists, poor lists, communion rolls, pew lists and so on. A number of churches carried out private censuses for various reasons. The following church census returns are available in the PRONI church collection on microfilm. The content and nature of these census returns varies in quality. Some are merely a list of heads of households (Drumachose Church of Ireland) whilst others name each family member (Magilligan Presbyterian). These records should be viewed as 'census substitutes' as most do not name every householder. 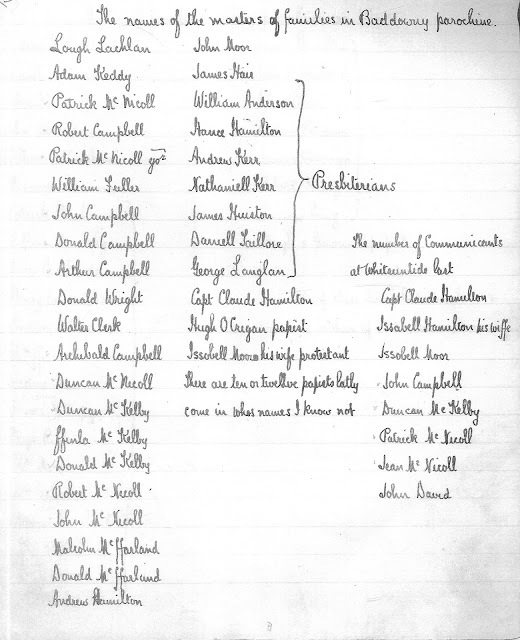 I have recently transcribed the whole of the 1803 'census' for Faughanvale parish and the findings were most interesting. This 'private' census was carried out by the Rev Elias Thackeray (1766-1854) minister of Faughanvale parish (from about 1800 to 1807). 1803 was a significant year. Britain declared war on France in May 1803 and thus began the Napoleonic wars. 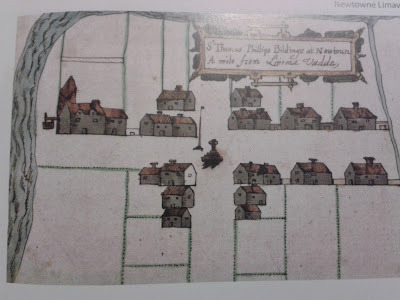 During a scare in 1803 about an invasion of Ireland, resulting from the planned but abortive resurrection of that year an agricultural census for maritime parishes was carried out, enumerating stock, wagons and horses available for transport as well as crops. 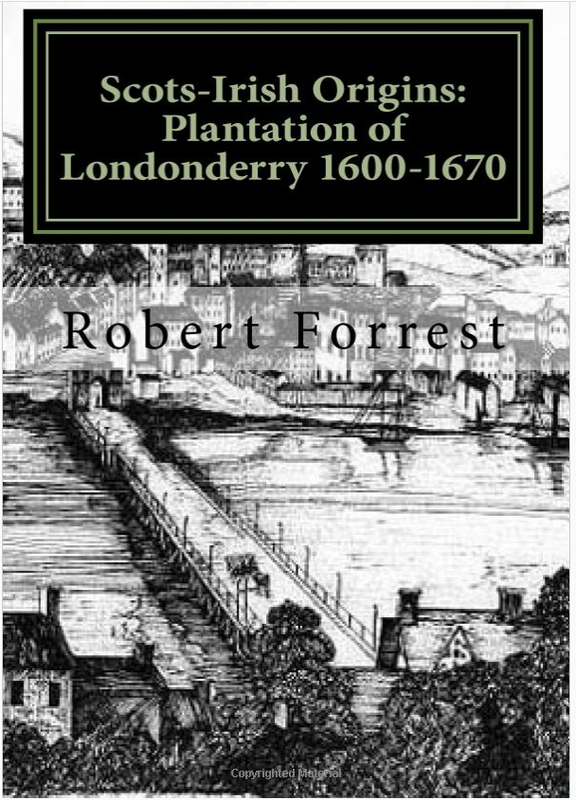 The surviving returns relate to many parishes in County Down and the northern parishes of County Antrim. 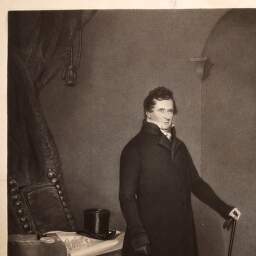 Elias Thackeray was born and raised in Cambridge and when a regiment of Fencible Dragoons was stationed in his home town he accepted a troop and came with his regiment to Ireland in 1797 and was stationed in Derry. For a while he was a superintendent of the Yeomany Corps in Derry before deciding to pursue his original intention of entering the Church (Newry Examiner & Louth Advertiser 6 May 1854). Given his military background Thackeray was concerned about the Napoleonic threat. He made a call to his parish for men to enlist in a militia and the names of 49 men are recorded in the parish records. Capt E Thackeray wrote 'be this a public record of the parish it is thought right to insert the names of those persons who step forward at a crisis so important for the defence and protection of their country' and 'it will be a standing record against very many persons who have shamefully held back at the moment of such importance'. The date 1803 is then of significance in giving context to the census carried out by the Rev Thackeray in Faughanvale in that year. This contextual detail helps us to understand the nature of the records. The census records the name of the head of household (sometimes occupation is given) and often the name of his wife (and maiden name) together with the number of boys and girls in household. There are approximately 184 households with 253 boys and 205 girls present. In total the number of Church of Ireland members in the parish was 739 persons. Interestingly, Thackeray notes mixed marriages (31 in total) and identifies the non Anglican spouse as P (Papist) or D (Dissenter) and does not include these persons in the totals. John Donnaghy, Glazier and Ann Lawther, 'P' 2 boys and 2 girls. 3 in total. Simple maths indicates that there were 6 members in this household yet Thackeray indicates only 3 present. Thackeray attended Eaton and was a Fellow of Cambridge University so a highly competent man. Initially, the figures were confusing to me but we know that Thackeray indicated that Ann Lawther was a Catholic and not one of his congregation. It seems that in this household a decision had been made to raise the boys in the faith of the father and the girls in the faith of the mother. Hence, John Donnaghy and his two sons were Episcopalian making a total of three Episcopalians in the household. In the case of mixed marriages between Catholic and Protestants often an agreement was reached to raise the female offspring in the faith of the mother and the male offspring in the faith of the father. Apparently, this was a common occurrence in mixed marriages of the time under a benevolent convention known as the Palantine Pact (Francis X McCorry: ‘Parish registers – Historical Treasures in Manuscript’, Lurgan, 2004, p.17). Such marriages were looked on with disfavour by the Catholic Church but they were admitted to be canonically valid. If a mixed marriage had taken place in a Protestant church it was to be followed by a Roman Catholic ceremony (and where this had not occurred the Catholic party was to be excluded from the sacraments), and this remained the discipline until the middle of the nineteenth century. Thackeray also gave indication as to 'apparent condition of each' family using a coded formula. Letters such as P, VP, MP, G, VG are scattered throughout the text - Most likely P = Poor, VP = Very Poor, MP = Moderately poor; G = Good and VG = Very good. E Thackeray, Curate & Rebecca with one friend and two servants: 5 in total -- Poor enough. Landlord was given as Mr McFarland. (Note - Rebecca was his wife nee Hill).